I was anxious to use some new pattern papers from Tilda: the Corner Shop and Tiny Treasures. Recipe: This card is larger than my typical A2 size, it's 4 1/4" x 6". I am pairing it with an A6 envelope, to give the banner, and button some extra room. Ok, I started with the kraft card stock purchased from a big box store. I lined the inside of the card with a piece of very vanilla card stock, and then matted it onto steel blue card stock. So, I used the same sheet of pattern paper, and show-cased both sides of this beautiful pattern paper. The striped pattern paper has this beautiful polka dot trim. Since I added some cotton trim and ribbon to the top of the floral pattern paper, I purposefully turned the striped pattern paper, so the polka dots would be near the bottom of the page. I cut the floral pattern paper 1/2" smaller than the striped pattern paper. I used my thread cutter to distress the edges of both pattern papers. I machine stitched the cotton trim along the top edge of the floral pattern paper. I then sewn a strip of blue stitched cream ribbon across the cotton trim. I also did a double border stitch on the floral pattern paper. I added foam tape to the back of the paper doll card, to help give it some height off the card front. I sponged baked brown sugar classic ink along the edges of the banner pieces. I used glue dots to hold the banners to the cream twine. 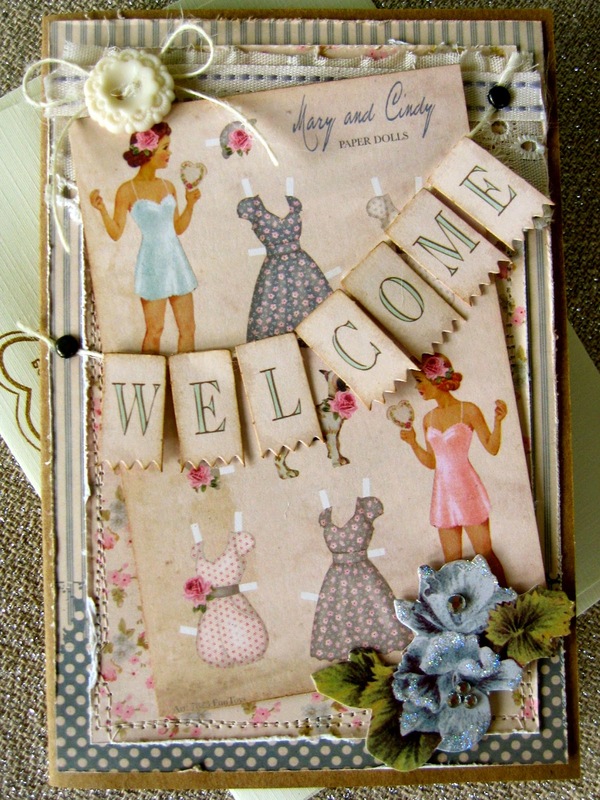 I secured the banner 'string' (cream twine) to the card front with vintage metal brads. I added a vanilla button to the top left corner of the card. I also tied a simple bow behind the button. Finally, for the floral cluster I added glitter to the petal tips, and rhinestones to the blossom centers. The floral cluster is adhered to the card front with foam tape, also. Thank you for stopping by! 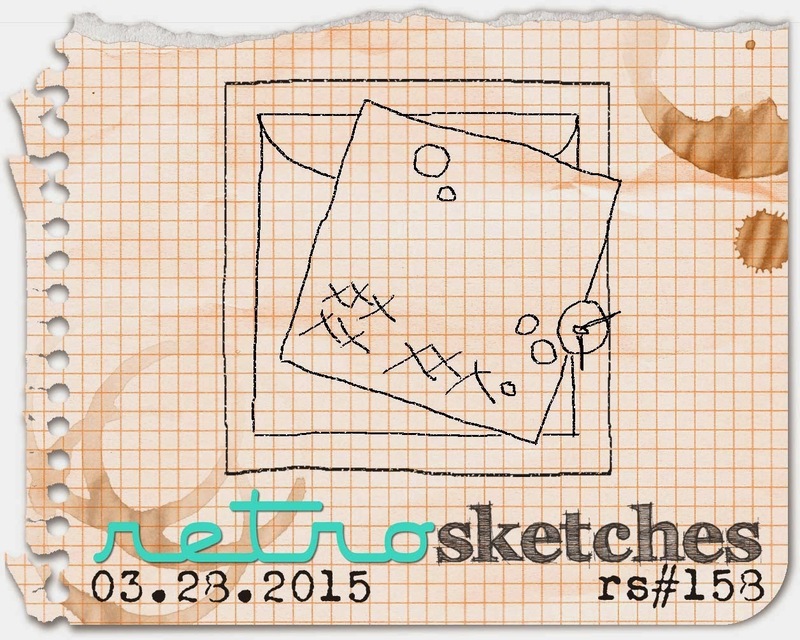 and I hope you have been inspired to play along with the wonderfully talented ladies over @ retro sketches.